In the month of July 2017 Staat van Beleg could list 848 human rights violations (and 195 reports/analyses). (see our archive). Every month we are highlighting another aspect of the occupation of Palestine. 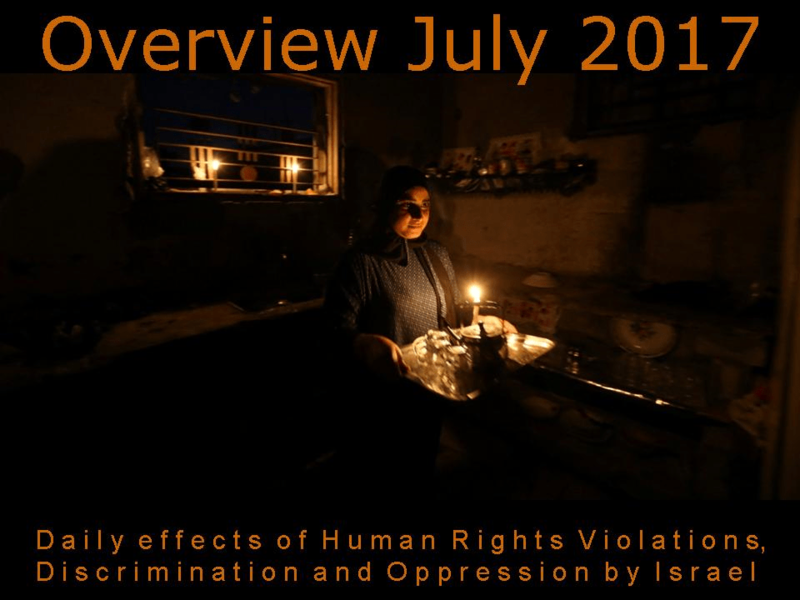 This month we will focus on the dire situation in Gaza due to the continuing electricity crisis and specifically to the question who bears responsibility. “Israel has consigned the people of Gaza to “living in abject poverty under practically inhuman conditions unparalleled in the modern world,” the human rights group B’Tselem said last month. Since Israel deducted the electricity supply to Gaza the situation has deteriorated even further. At the time of writing the people from Gaza only get two to three hours electricity per day. What that means for them we can read in this article of Anera. 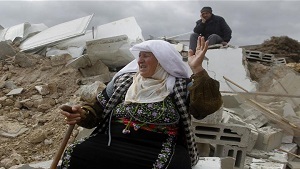 Co-founder of Electronic Intifadah Ali Abunimah told Aaron Maté of the Real News during an interview : “This is not a natural disaster. This is a policy choice by Israel to do this to 2 million people, and it’s a policy choice the so-called international community are supporting,”. Among all the news we can read about the ongoing crisis in Gaza and answers on who bares responsibility this interview will give you a good insight. 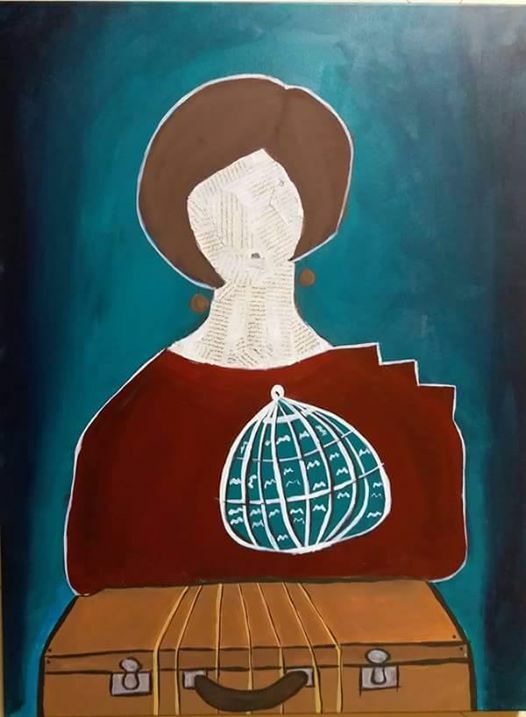 Malak Mattar, an artist from Gaza dedicated this work to the ongoing humanitarian crisis in Gaza. The desire to move, to travel, is inherent in all human beings. And in Gaza, it has become a burn in our stomachs and a pain in our hearts. Our suitcases are always at the ready, because we never know when Rafah will open or Israel will grant a permit. We are forced to live lives of constant uncertainty and disappointment. Most of us never do get out, which is why each one of us carries a cage inside—reflecting the bigger cage outside. And my face? My face is blank, except for newsprint, because the media gives us hope with news of imminent relief—then dashes them the next day. Soon, we will lose even the ability to hope.